Did I photograph a ghost at Monte Cristo – ‘Australia’s Most Haunted House’? 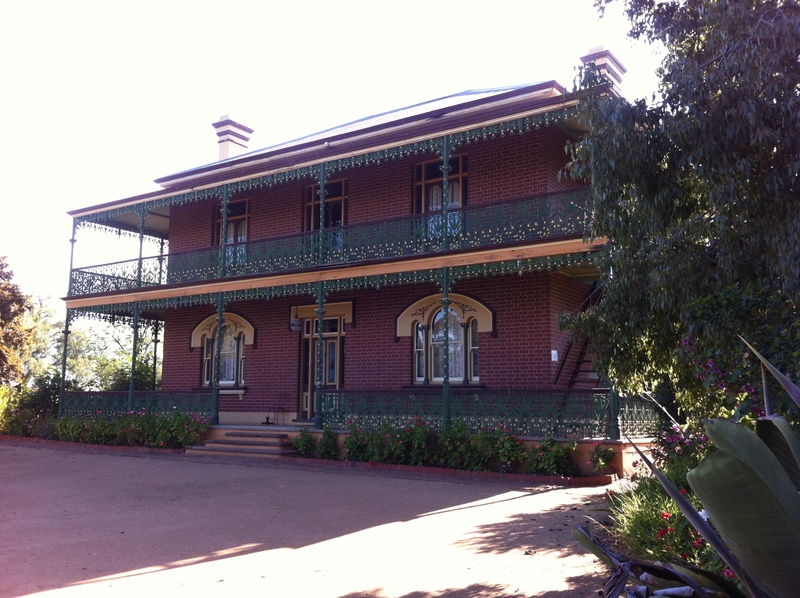 A couple of weeks ago, I went on a 3-hour ‘ghost tour’ (supplemented by an excellent 3 course dinner, a bed for the night and a cooked breakfast) at the notorious Monte Cristo Homestead in Junee, NSW. It has been dubbed ‘Australia’s most haunted house’ and has a long history of ghostly shenanigans. The resident flesh-and-blood family, the Ryans have built it up as a paying concern for aspiring ghost-hunters and tourists, with the grudging co-operation with the resident spectral family, the Crawleys. The place has an interesting history, dating back to the 1870s, and has been meticulously restored by the very talented Reginald Ryan, who died just a few months ago, and – of course – continues to live there now in spirit form – or so his widow told me. Anyway, I found myself the sole self-confessed skeptic in the motley bunch of believers, several of whom tossed the term ‘skeptic’ about with a knowing wink and indulgent smile, and some of whom clung tightly together for reassurance as they reported chills, heart palpitations and creepy brushes with the cobwebby fingers of phantoms. We trudged around the house by candlelight and listened to horror stories spun with showman-like eloquence by our host, Lawrence ‘the Legend’ Ryan, who grew up there and has decades of creepy experiences to draw upon. I found the whole experience interesting, slightly amusing and even a bit disappointing. Seriously. I sensed absolutely nothing of the supernatural, even after spending a night with an open mind in the most haunted house in the country. Either I’m tone-deaf to the spirits, or of no interest to them so they ignore me, or…as is overwhelmingly probable, they don’t exist, except in our imagination! the large mirror. What can you see? 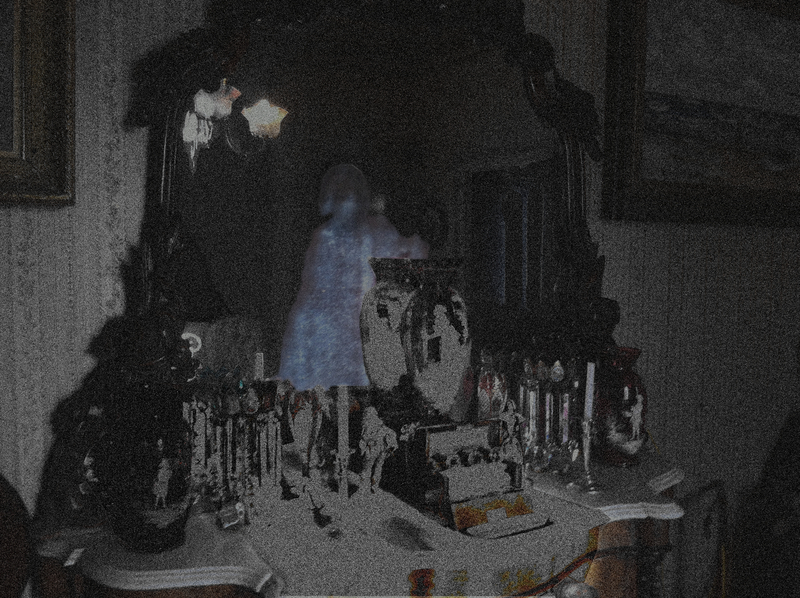 Could that possibly be a ghostly figure standing there? ~ by Garry on October 25, 2014. I definitely see something in the mirror….Mrs Crawley perhaps??? well, apparently the room in which I took this photo was a favourite parlour of Mrs. Crawley and there are lots of stories of her making her presence known in that room – as well as the ghost of a child. I have to say, the room didn’t feel at all creepy to me. Did you use a ghost filter app when taking that photo? hmm, a ‘ghost filter app’. Never heard of it, but I’ll bet if such a thing exists, there are people who would put it to all kinds of nefarious uses!